The second time I died during Outward’s tutorial, around section 32, I started to wonder if volunteering to review this game was a mistake. I was learning how to sleep and somehow did it poorly enough to die of either dehydration, cold exposure, or both. About an hour later, when I bled to death just steps from the starting city’s gate after being pecked by a giant chicken, I regretted my choice even more. 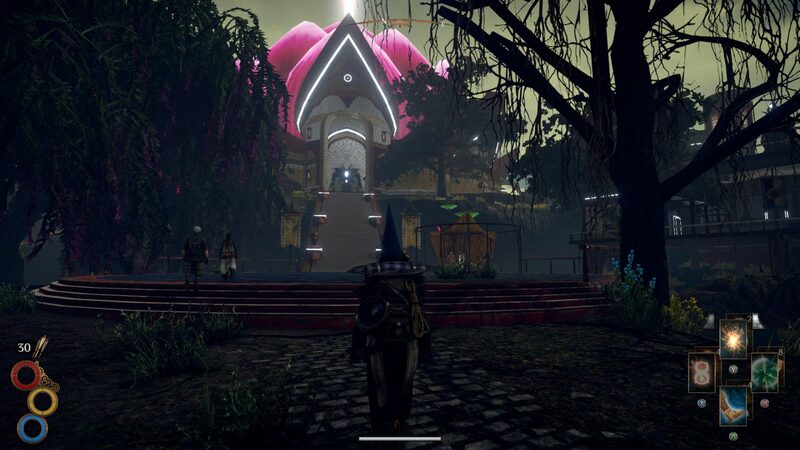 Little by little, I started to adjust to Outward’s uncompromising rules, and just as gradually, it started to grow on me. But at the same time, new frustrations surfaced to balance out my growing enjoyment. Outward is one of the most inflexible, punishing games I’ve ever played. If you play it, there will almost certainly be times when you hate it, but you just may grow to love it as well. 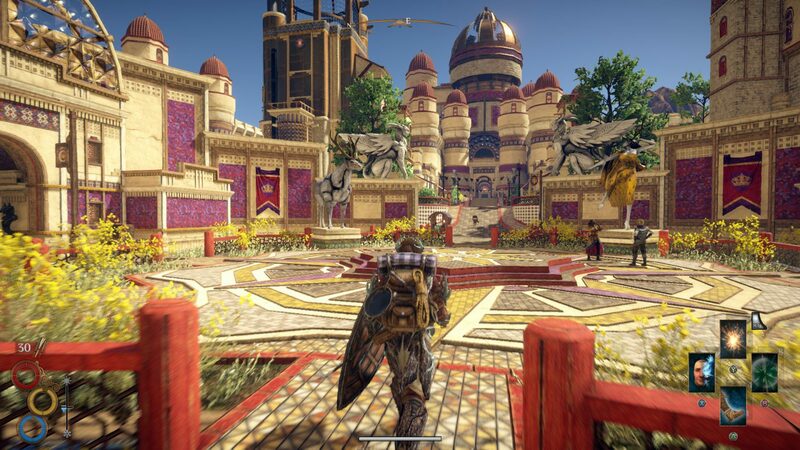 At first glance, Outward looks like an action RPG along the lines of Dark Souls, Dragon’s Dogma, or Skyrim in 3rd-person mode, and some of the broad strokes are the same. You’ll travel from town to town picking up quests from NPCs along the way. You’ll buy or loot better gear, use potions to buff your combat skills, and maybe learn how to sling fireballs. But. Outward is a different kind of game altogether, both in its minute-to-minute experience and overarching goals. Outward is a game where a good meal is just as important as a sharp sword, because while you may be an adventurer, you are not a hero. Outward’s biggest accomplishment is how it hides a full-fledged survival game under the cloak of a standard RPG. 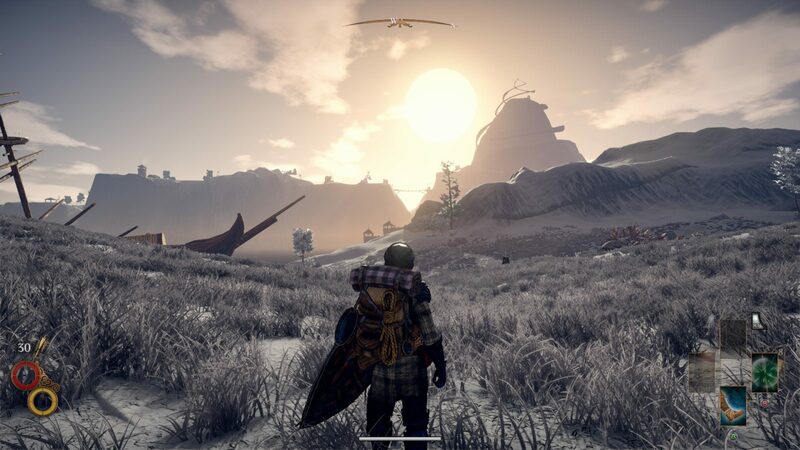 In Outward, you’ll have to make sure you eat, drink, sleep, and maintain your temperature while you go about all the questing you’d expect from similar games. That means wearing the right clothes for the weather, preparing food and drink before leaving town, and knowing when and where to set up your tent for the night. I liked that, even if you’re completely empty-handed in the wilderness, you can scavenge everything you need to survive and craft basic tools without needing a workstation. Gather wood for a fire, skin some animals to make a bedroll, then cook their meat and go to sleep. It’s the kind of thing innumerable mods have tried to add to Skyrim, but here, it’s baked into the experience. Unlike some survival games that seem to make your characters need 12 hours of sleep and 10,000 calories per day, your needs in Outward are much more manageable. You need to eat and drink a few times a day and get a good night’s sleep to stay in top form, but you’re not constantly stuffing yourself and sneaking away for a nap after every combat encounter. Even if you decide to relive your college days by eating only what you can scrounge from other people when they’re not looking and sleeping three hours a night, it won’t kill you right away. Instead, you may start moving slower or losing some of your maximum stamina. Your basic needs in Outward are easy enough to sink into the background — until you’re in a spot where you absolutely can’t fulfill one, and then they come front and center. This focus on the mundane details of adventuring extends even to inventory management. You actually have two inventories: a backpack, which can be removed, and a pocket, which always stays with you. In combat, you’ll generally want to drop your backpack, as it slows down rolling, so you’ll want to make sure you have the essentials in your pocket. If you leave health potions or weapons in your backpack, you won’t be able to use them until you pick it back up. It’s a small detail, but it shows the developer’s commitment to making an adventure sim rather than a standard action game. The game’s opening hours go to great lengths to show how you’re not a hero; you’re just some schmuck trying to pay off their debt. When the game starts, you’re defenseless as a lamb against even the lowliest enemies, and the slow accretion of gear and skills that let you stand a chance in the world is immensely satisfying. To even pursue magic at all requires a dangerous journey into the heart of a mountain, a sacrifice of health and stamina, and an investment of lots of time and money to learn new spells, followed by studying how spells combine to make them worthwhile to use. As the game goes on, however, it leans away from the feeling that you’re a neophyte struggling their way through the world to push you more and more toward combat, and that’s where it starts to falter. As much as I tried to get into Outward’s combat, because I was enjoying the rest of it, I just never could. 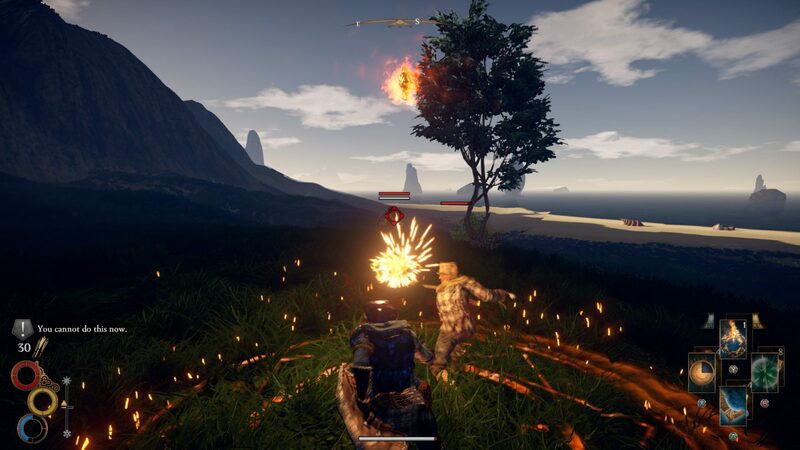 Like so many other games, Outward has a stamina-based combat system, where each stab or dodge depletes a portion of your stamina, and when you run out, you’re stuck catching your breath for a moment. In Outward, however, you run out of stamina with just a few actions, and it refills at a glacial pace. Your attacks don’t generally do a huge amount of damage to your enemies, either, which means every fight drags on about twice as long as it feels like it should. Your enemies, on the other hand, can often take you down in just a few swipes and they don’t seem to be limited by stamina, gleefully swinging away as you wait your turn to attack. There’s nothing that sophisticated about the way your opponents act, either. A lot of them just wait until you attack, then hit you in the middle of your swing’s animation, leaving you with no good way to defend yourself. On top of all that, combat just feels weightless, as your attacks have long animations and land without any real impact. It would be one thing if combat were a last resort or something to work up to later in the game. Unfortunately, after the first few hours, you’re constantly thrown into long combat sessions with no good way to refill your supplies between waves of enemies. The game’s reliance on combat seems to run counter to its idea that you are just an ordinary person in the world, not its savior. If the average citizen ran into as many demonic Chocobo knock-offs and bandits as I did in my first few hours, the human race would have gone extinct long ago. Even more than the excessive combat, Outward’s quests absolutely wreck the idea that you’re anything but the star of the show. You regularly get embroiled in events that shape the course of the world, some even wiping entire towns off the map. When, by the end of the game, you’re almost solely responsible for the political landscape of an entire continent, it becomes harder to take seriously the threat of being pecked to death by a giant chicken or dying in a field because you got indigestion and couldn’t keep any food down. I say “dying,” but one of Outward’s most interesting ideas is that you never actually stay down for good. When you run out of health, you’ll instead be spirited away to one of several locations which seem to be chosen based on where you were knocked out and by whom. You may wake up in the nearest town, on the beach, at the campsite of an unseen benefactor, or, if you’re particularly unlucky, in a dungeon. If you were wearing your backpack at the time, you can find it nearby. If not, you’re in for a long walk back to wherever you lost it (your compass will graciously point the way back to your pack whenever it’s dropped). It’s a great way to turn the game into one continuous story about your triumphs and defeats, rather than a disjointed narrative chopped apart by reloading save points, but it does lose its charm after a while. There were times when I would have rather just started from a checkpoint than slogged through whatever complications it presented. I suspect I would have felt differently if the rest of the game wasn’t so laborious. There were plenty of moments where Outward truly shined. For all of its faults, it really nails the feeling of preparing for a grand adventure and setting out into the world with nothing more than the bag on your back. Every time I acquired a new piece of gear or a skill, it felt earned, and substantially improved how I thought about my place in the world. Even getting a new backpack or lantern in Outward feels better than finding some legendary weapon in many games. I sometimes found myself at the end of a successful expedition without enough stamina to get home as the sun was setting, so I scouted a good campsite, laid out my tent, and slept long enough to watch the sun rise over a distant crest. Outward’s graphics aren’t technically impressive, but the game does have a knack for creating some breathtaking views once in a while. There were even a few points early on, where the world presented something so strange and alien that I was somewhat reminded of playing Morrowind for the first time and exploring a world utterly different from my own. But these are momentary joys, surrounded by an often much more frustrating trek through a much more generic world. 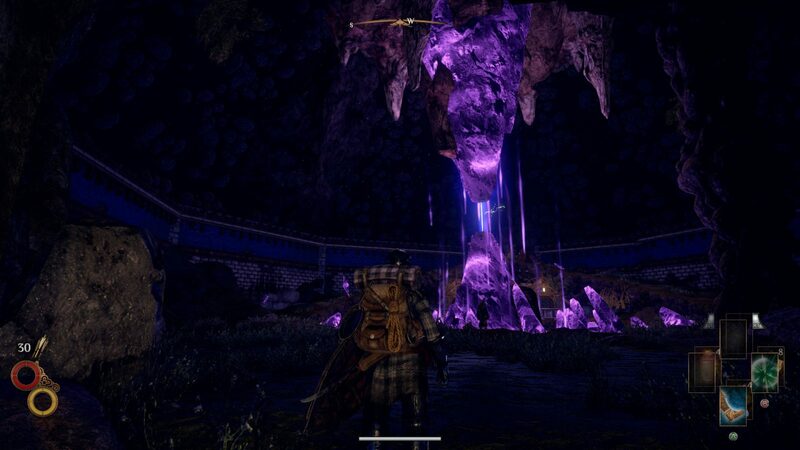 There’s a lot to appreciate about Outward, and there’s certainly an audience for it; I just wish it played more to its own strengths. I think I may appreciate Outward, for what it attempts and for the feeling it gives me in its best moments, more than I actually enjoy it.